Hello! It's time for a brand new Mojo Monday sketch (#213).. I hope you will join us for Round or Square week! Accessories: A Cut Above Verve Dies: Loopy Blooms, Charming Oval (Verve); Crochet flower, Felt, Pearl (Pizzazz Aplenty), Foam tape, Thread, Sewing machine. Such a fun card, Steph! Love that crocheted flower. So nice! Really like the papers you used and I agree, love the crocheted flower! So bright and cheery! Great job! Wow! I love this - gorgeous! 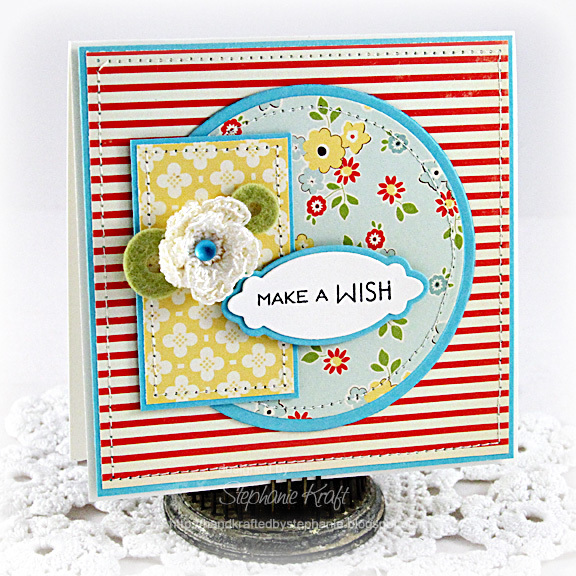 Such a bright and cheerful card - Very pretty! Very pretty cheerful card. beautiful flower. Such a lovely and cheery card! Love the color combo, flower, and stitching. So cute! Love the playfulness of this card. Fab dp's, and that crocheted flower is so pretty with the floral dp. Your card is so sweet! I just love the paper selections! And your crochet flower! Love this card, the sewing on it and the simple sentiment as your focal point are just perfect! Have a great weekend!